The combination of materials and styles are just right for a vintage house, yet it looks young and fresh and modern. Here's Emily's stainless Kitchen Aid double drawer energy efficient dishwasher, and Rohl apron-front farmhouse sink. "I was determined to have multiple stains to add interest to the kitchen, but my builder refused to do it. So, my husband and I painstakingly taped off each "diamond" using painter's tape. My husband Brandon figured out the mathematics of a grid system as we bagan taping. I had the tedious task of using a drafting triangle and exacto knife to carve out each place the tape crossed, so that the corners lined up just right. Even though we wore knee pads, we were so sore that we could barely walk for days. We like to joke that if our marriage can survive that it can survive anything! The builders actually did the staining process, but we still take credit for the hard part!" Simple white subway tile from Dal-Tile. 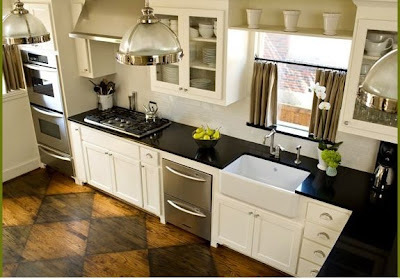 Black granite countertops from Absolute. Kravet's beautiful burlap fabric at the windows. Restoration Hardware's Clemson pendants. Here's Emily with her husband and daughter. They spend most of their time in the kitchen, and who can blame them. Says Emily: "My husband and I both love to cook, so our kitchen is one that is truely used. In the winter we love to make hearty soups, chili and pastas. In the summer we use our grill for bbq, burgers and fish. the summer dishes are always accompanied by huge salads and whatever vegetables are in season. Most week-nights, I am cooking one-handed with a two-year-old on my hip. She is always eager to "help! On the menu tonight: flu-season-chicken-pie.. the ultimate comfort food." 1. Heat oven to 425 degrees F. In a 2-quart casserole, evenly spread out chicken. In a medium saucepan, whisk together broth and soup; bring to a boil over medium heat. Pour over chicken. 2. In a medium bowl, combine flour and pepper; stir in buttermilk and butter. Pour over chicken (do not stir); smooth top. 3. Bake pie, uncovered, until browned and bubbly, about 45 minutes.